Whitening your teeth, under the supervision of your dentist, has been proven safe in clinical studies over a period of many years. The primary ingredient in Opalescence is carbamide peroxide, witch has been safely used to brighten the smiles of millions of people world wide. After you have the white smile you’ve long desired, it’s important to keep it that way. Practice good oral hygiene and always remember to brush after consuming staining food or beverages. 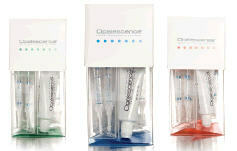 Opalescence Whitening toothpaste is a wonderful product for maintaining your bright smile. It not only whitens, it offers a higher fluoride uptake than any other toothpaste. It is available through your dentist or by calling 800-552-5512.